Research: Tips for using resource materials and the internet: How to find it and use it safely. 1. Always ask your parents for permission before using the internet. 2. Talk with your parents to set up rules for going online. Decide how long you can use the internet. Decide what websites are okay to use. 3. Check with your parents before giving out personal information like your full name, address, telephone number, or the name of your school. 4. Never give your internet password to anyone, not even your best friend. 5. Never send anyone your picture without your parent's permission. 6. If you receive a message or see information that makes you uncomfortable, TELL YOUR PARENTS! 7. Never agree to meet someone that you meet on-line, unless it's okay with your parents, and one of your parents goes with you. 8. Do not respond to any messages that are mean or make you feel bad. Tell your parents right away. 9. Never download or install files or software on your computer without your parent's permission. 10. Have fun by being a good on-line citizen. Use appropriate language and do not do anything that hurts other people. We will be learning about lots of interesting topics in fourth grade. That means lots of reading and research. We will discuss how to identify the differences between fiction and non-fiction materials. We will learn how to use the index and table of contents in non-fiction books. 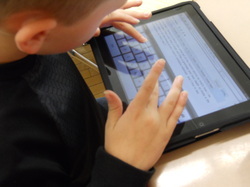 Many children like to do additional reading on the internet. These websites are designed specifically for children. How Can You Tell If This is a Good Website? When we use books for research, we can easily tell who the author is and when it was written, but anyone can be an author on the internet. For this reason, we need to make some judgements about whether a particular website is a good resource. We want to think about whether this author is an expert and knows what they are talking about. Use the questions below to help you decide if the website you are using is a good website to use for research. Is there a biography of the author on the page? Is this person an expert? What school or company sponsors the website? When was the site made or updated? Does the information agree with other things you have read? Did you see any information that you know is wrong? Are the pictures and illustrations interesting and useful? Would you recommend this page to other students?